Sen. Anthony Pollina makes the case for an ethics reform bill for government officials. Senators poked at details of an ethics reform bill Tuesday, with one calling it a “pretty big pile of mud,” but when it came time to vote, every lawmaker in the chamber voted to give preliminary approval to the measure. “Given the fact that we’re one of the few states with no ethics regulation, this is a first step to get us where we need to go,” said Sen. Anthony Pollina (P/D-Washington), lead spokesman for the bill on behalf of the Senate Government Operations Committee. 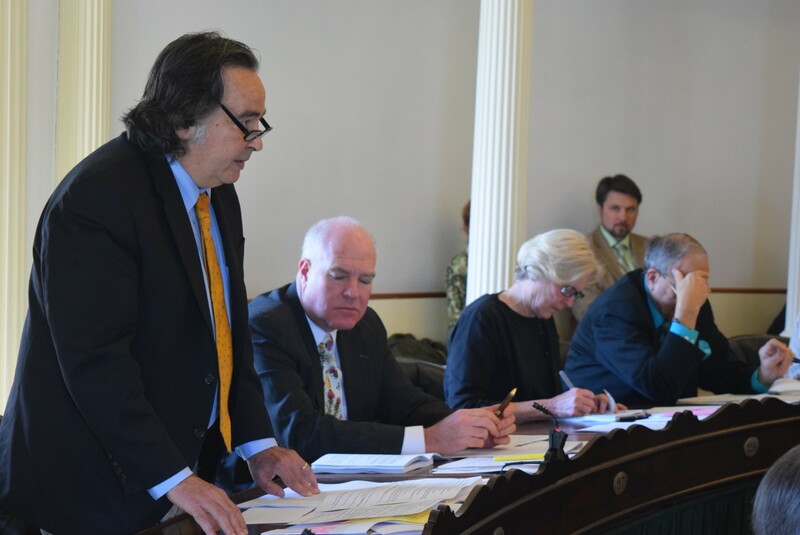 The bill disappointed Paul Burns, executive director of the Vermont Public Interest Research Group, because it fails to include a ban on candidates accepting contributions from anyone who has bid or plans to bid on a state contract. He argued that Gov Ops flip-flopped on the ban. Tuesday, the committee proposed that the ethics commission, which the bill sets up, should study the need for such a prohibition. The bill would, however, clamp down on a practice that 33 states have already restricted — the so-called “revolving door” between government and advocacy. The bill would make legislators and top government officials wait at least one year before going to work for private clients to advocate before the legislature or other public bodies. The measure would also mandate that candidates for the legislature and statewide offices disclose sources of income greater than $10,000, income from employment, investments and leases or contracts with the state, as well as list boards on which they serve and companies in which they hold controlling interests. State officials, including agency secretaries, commissioners and their deputies, would be required to file similar disclosure forms. “We aren’t blazing any new territory” with the disclosure requirement, Sen. Joe Benning (R-Caledonia) said. “We are behind the times,” he said, noting that 27 states already have disclosure requirements. Sen. Jane Kitchel (D-Caledonia) wondered whether a landlord would list rent as an income source if the landlord lost money. Benning replied that the executive director of the commission could offer advisory opinions. “So if we have a lack of clarity, we are going to rely on a part-time exempt employee to interpret the law?” Kitchel asked. “I don’t think we have a lack of clarity,” Benning said. But when the senate secretary called the roll, every senator voting ahead of him had said ‘yes,’ so he joined the chorus. Senators also approved two rules that establish ethics complaint procedures and disclosure requirements for themselves — but not before some back and forth about the independence of the legislative ethics panel being set up to review complaints about senators. Senate Majority Leader Phil Baruth (D-Chittenden) argued that the Senate Rules Committee should have the final say about the procedures. In fact, the current rules committee has already written a set of procedures. Baruth argued, “I think we need something in place now” — before an ethics panel is named next January. Ayer countered that the rules committee could simply ignore proposals from the ethics panel. With compromise elusive, Senate President Pro Tempore John Campbell (D-Windsor) postponed action on the rule by the full Senate and reconvened the rules committee later in the day to resume the debate. When the rules committee reconvened, all sides had agreed on a compromise that allowed the ethics panel to offer revisions to the procedures developed by the rules committee and required the rules committee to consider those revisions and report on them to the full Senate. The Senate will vote again on the ethics reform bill Wednesday. Then the bill goes to the House, where its fate so late in the session is uncertain.